Detach garage floor plan not only is similar to shed plans, it is very simple to do. On the other hand home addition plans or home addition floor plans are more challenging because the plans require to show the existing house and how the new addition is going to fit in with the existing utilities, pathways, windows, etc. 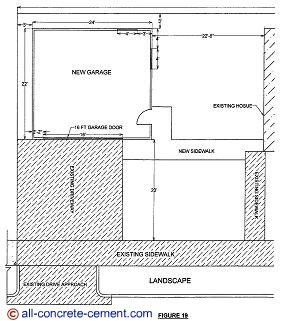 Preparing garage floor for plan review and approval does not require those detailed info. Figure 19 is an example of detach garage floor plan. This garage was drawn for a real estate investment company where they buy old homes, modify them and either resell or rent. In this particular project, the new owner wanted to add a detached garage behind the driveway that the previous owner had built. Detach garage plan needs to show locations of garage door, doors, and windows if any. To help framers measurements from corners to windows and doors are necessary to show on plans. Often forgotten when drawing detached garage plan and shed plans are the power supply. Unlike home addition plans where power is tied in to the existing house wiring, the power for detached structure are required to be underground. Ninety nine percent of the time this discovery does not occur until the garage door is ready to be installed. By that time all the concrete are already poured. Trying to pass anything below an existing sidewalk, patio, or driveway is a major work. To prevent any unforeseen work that might come up in the future, it is a good practice to always put a few 2 inches diameter pipes below any concrete that you do at your property. This will allow for power, water, or sprinkler lines to run beneath your concrete slabs. The biggest challenge in drawing detached garage is trying to meet city code requirements. Some requirements call for the face of the wall to be 3 ft from the property lines, as the case in figure 19. Others require the edge of the roof to be 3ft or 12 inches from property lines. Other requirements for detach structures includes heights measured from garage floor to top of roof pitch. This height requirement has to be shown on building section or elevation. All of these requirements must be followed prior to plan approval for construction. Do you need garage addition plans or detach garage plans drawn to your specific needs? All we need are few elevation photographs, your lot layout and house layout and we will be happy to provide you a quote. Email these to info@all-concrete-cement.com and we will promptly respond with all the details and cost.